The Master of the Muse. Brandy Beavers. The Master of the Muse by Brandy Beavers. I once saw a documentary in which a group of credited scientists held a controlled experiment. The premise was simple. They recruited forty young men with no formal artistic training and divided the group in half. The first twenty were taken one-by-one into a holding room before the experiment commenced, or so they thought. Each man sat alone for some time in an empty waiting area, then lead into another room where art supplies and a blank canvas awaited. They were given a topic and asked to paint, expressing their thoughts upon the blank surface. The next group of twenty was asked to do the same, only this time something was different. When the young men individually arrived to the waiting area, an invitingly beautiful young woman greeted them. There the two would sit in close proximity; her manner was engaging and flirtatious. Each young man reciprocated her advances and walked into the next phase of the experiment with a distinct pep in their step. That’s not all that was distinctly different. The art produced by the men who had been engaged by the young lady compared to the unfortunate guys who did not have this inspiration, was more colorful, more intricate, more creative; MORE EVERYTHING! The young woman was a MUSE. According to the dictionary the word describes a guiding spirit, a source of inspiration or any of the nine daughters of the Greek God Zeus. When it comes to the world of contemporary art the leading man who is held in critical acclaim for “Mastering the Muse” is none other than the world famous, figurative artist A.D. Cook. A.D. goes on to finish his statement with, “There is nothing I would rather paint and my art is a reflection of that beauty. That is my truth.” The truth is… “Art Nudes” are timeless and have been the inspiration of such iconic artists as Michelangelo, Raphael, Rubens and many other great masters throughout the ages. A.D.’s passion to create contemporary nudes engages him to leave his own distinct mark that transcends the test of the eternal hourglass. When I arrived at A.D.’s studio for the interview I was greeted by the artist with a warm smile and embrace. You see, I not only write about A.D. from an observers point of view but I write about A.D. from a unique perspective – that of the MUSE herself. Having been the model for his painting titled “Valhalla”, I saw first hand the professionalism and raw skill that goes into his craft that has been referred to as “flattened sculpture.” This is due to the way A.D. layers the paint on his canvas. The realism is indisputable. His images are often mistaken at first glance as photographs. Viewing his work up close is breathtaking. The scale is grand and the way the paintings shift when exposed to different levels of light gives off an electrifying effect, breathing life into the image. His latest masterpiece titled “Nirvana” is testimony to that. We gazed upon the solitary curves of the angelic figure painted in cool, soothing tones of blue. The background sky flickered with golden stars. A.D. then proceeded to dim the spotlight and ignited each pinpoint into a glowing majestic sky of individual dots made of pearl paint mixed with phosphorus. This mixture allows the paint to absorb light and release a florescent effect even after the energy is extinguished. I could not help but be intrigued by what looked to me like a cubist design across the top. When asked what the golden squares were, he explained that it was actually binary code encrypted in plain site, which translated reads “GOD”. There is also coding in A.D.’s new collection of contemporary abstracts. Like predecessor Jackson Pollock, he uses the whimsical, harmonious chaos and vibrant energy of controlled, yet splattered and thrown paint with an added element – the balanced placement of binary code and i-ching characters. This juxtaposition between the wild expression of the art and the controlled usage of higher thought in code and graphics is masterful and intriguing. A.D.’s art has been showcased in fine art galleries from Key West to Hawaii. His innovations have been featured and unveiled at ArtExpo in New York City. His work has been showcased in a myriad of books and magazine publications including Art Business News and American Art Collector. His use of metal allows him to ingrain the image by hand from the forethought of his vision. His canvas prep techniques are revered as an industry standard and his metal preparation videos for artwork are among the most viewed and studied online. After A.D. gave me a tour of his new collection we sat down in the studio for a cup of tea and a casual chat. He spoke of the man who inspired him most, artist Chuck Close. He then proceeded to show me a video about the man who is considered one of the world’s best contemporary painters. We laughed and talked about the exchange of creative energy amongst people and how powerful it is. He often has live musicians performing in his studio when he is painting or photographing his models. The music feeds the art and the art inspires the music. We reminisced over the year prior when I was brazen enough to disrobe and step into the canvas as a MUSE myself. It was a liberating experience and the understanding that it may end up in a museum one day when I am long gone, gave me great satisfaction. He asked if I would like to model again. We scheduled the shoot for the following day. I arrived with little make-up and not much else for that matter, no need. We shot in the morning with the natural light of the day bathing my skin and hair. A.D. photographed me in ethereal poses with long draping fabric strategically placed to hide and accentuate. For a moment caught in time, we were inspired. For a moment we shared the exchange of creative energy as MUSE and ARTIST. For a moment we stopped the hands of the clock and stepped backward into a timeless tradition that will forever transcend analogical time. Just as A.D.’s mentor has prompted him to create through his genius, A.D. Cook’s genius is prompted to live on. His art is a creation used to provoke and inspire. He ignites the creative path for observers, artists and muse of our time. A.D. Cook is the renaissance man of the future. 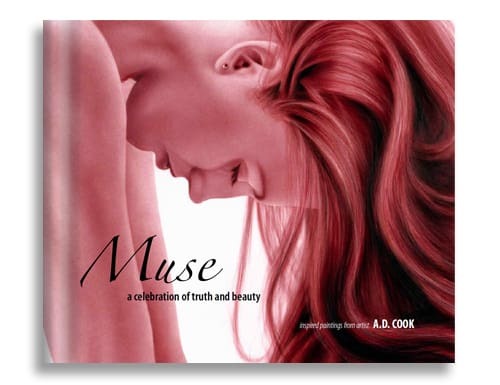 The above article is an exert from my forthcoming book Muse, a celebration of truth and beauty.